Prosecutors say MPs are expected to answer questions on an alleged bribe offer. 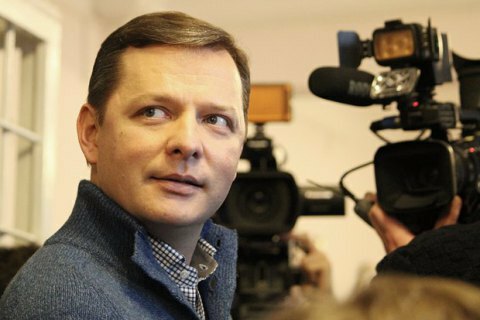 The Prosecutor-General's Office (PGO) has summoned the entire Radical Party parliamentary faction for questioning, its leader Oleh Lyashko has said on Facebook. "The entire Radical Party faction has been summoned to the Prosecutor-General's Office for questioning! This is a first in the history of the Ukrainian parliamentarianism that all members of an opposition faction get dragged for questioning every day. The authorities waged terror against our opposition force over our political position," he said. He warned the PGO of responsibility which he expects it to face "after a change of power and the prosecutor-general". The PGO explained that the Radical Party faction is summoned to testify on Lyashko's statement that a 50m-dollar bribe was offered to the faction in exchange for denying support for the PGO request to parliament to authorise the persecution of MP Sergiy Klyuyev. Lyashko made this statement, which was shared by mass media, on 13 May 2015, the PGO press service said. The PGO special investigations department is checking this case for bribery.